A Steam Trap is an automatic valve that allows condensate, air and other non-condensable gases to be discharged from the steam system while holding or trapping the steam in the system. Several different types of steam trap technologies exist to accomplish this extremely critical and necessary task. 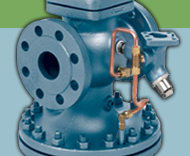 Watson McDaniel manufactures a variety of steam trap types and sizes to handle a wide range of applications. The bellows type Thermostatic Trap uses a fluid-filled thermal element (bellows) that operates under the principle of thermal expansion and contraction. The fluid vaporizes and expands as the temperature increases, causing the bellows to close the valve. As the temperature decreases, the fluid condenses and contracts, causing the bellows to open the valve. These traps provide excellent air handling capability and are used for drip, non-critical tracing and process applications. The main advantage of the thermal element is that on start-up loads, the trap is in the open position, allowing air and condensate to be rapidly removed from the system. Watson McDaniel thermal element traps offer wide operating pressure ranges, rugged welded stainless steel bellows, and various orifice sizes, making them a great choice for a majority of applications. 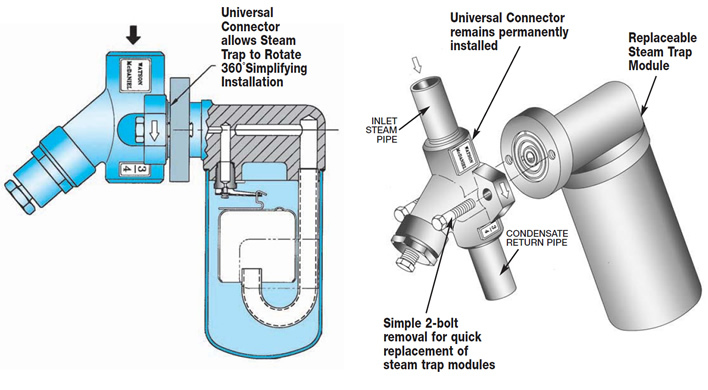 The Float & Thermostatic (F&T) Trap uses a float connected by a linkage to the valve plug to discharge condensate from the system. In addition, F&T traps contain a thermostatic air vent to allow the discharge of air from the system. For this reason, these traps have excellent air removal capability, which is advantageous during system start-up when large amounts of air are present in the system. Float & thermostatic steam traps are generally the primary selection for steam system drip applications, up to 30 PSIG, and for drainage of process heat transfer equipment, up to 450 PSIG. The Inverted Bucket Trap uses an inverted bucket as a float device connected by a linkage to the valve plug. The varying densities between condensate and steam are used to create a buoyancy force on the bucket to open and close the valve. These traps are primarily used in drip applications on steam mains and steam supply lines. They are generally not used in process applications due to their poor air handling capability. Bucket traps are extremely rugged and resistant to waterhammer and also resistant to any dirt and scale that may be present in the system. The WSIB Series inverted bucket trap is primarily used in drip and tracer applications. Inverted bucket traps can handle superheated steam when a check valve is used. These traps are also used on unit heaters, laundry equipment, and other small process equipment where slow start-up due to poor air handling capability can be tolerated. The IB Series (Models 1031 thru 1044) inverted bucket traps are available in several sizes and capacity ranges. Inverted bucket traps can handle superheated steam when a check valve is used. The smaller traps are primarily used in drip and tracer applications. These traps are also used on unit heaters, laundry equipment, and other process equipment where slow start-up due to poor air handling capability can be tolerated. Larger sizes are used on process equipment; however, since bucket traps have limited air handling capability, F&T traps are the preferred choice. Universal Connectors are used in steam systems to simplify the replacement and maintenance of Steam Traps. They allow Steam Traps to be removed and replaced in minutes without having to unthread piping. Two bolts connect the steam trap module to the permanently-installed universal connector, allowing the trap module to be quickly and easily removed and replaced using an open-end or socket wrench. Universal Style Steam Traps are commonly used in chemical plants, petrochemical refineries, paper mills and most other industrial facilities. Watson McDaniel’s WU450 connectors conform to industrial standards, making them compatible with other manufacturers’ universal steam trap modules. Watson McDaniel recommends using the Universal Style Steam Traps in any application, in particular those which require frequent maintenance or replacement of steam traps. The WU450 Series Universal Connectors are used in steam systems where a simplified and economical maintenance program of steam traps is desired. These universal connectors can be used for drip service on steam mains and steam supply lines, tracing, or small process equipment. Industrial standard 2-bolt universal connectors are commonly used in chemical plants, petrochemical refineries, paper mills and other industrial facilities. The WU450 connectors conform to industrial standards, making them compatible with other manufacturers’ universal steam trap modules. Models WD450 & WD450L are “Top Mount” Thermodynamic type universal traps. Models WD450SM, WD450LSM & WD450LSM-600 are “Side Mount” Thermodynamic type universal traps. Model WT450 is a Thermostatic type universal trap. Model WB450 is a Bi-Metallic type universal trap. Models WSIB450 & WSIB450H are Inverted Bucket type universal traps. Model WFT450 is a Float & Thermostatic type universal trap. Clean Steam Traps are used on clean steam applications as drip traps on piping runs as well as drainage for CIP/SIP systems and various process vessels. Each model has all wetted parts in 316L Stainless Steel and is available with Tri-clamp sanitary connections. The WPN Series of Bi-Metallic Steam Traps are used in steam tracing, steam main drips and non-critical process equipment. They can be used in outdoor applications that are subject to freezing. Bi-Metallic Traps will back up some condensate into the system and should only be used if this condition is permissible. The FM & FSM Manifolds are used for steam distribution to tracing systems and for condensate collection. They are typically used in chemical plants, petrochemical plants, textile industries, rubber plants and general industry. Manifolding your distribution and condensate collection system not only cuts down on installation and maintenance time, but also provides freeze protection.